Hanoi, in each season, has its own way to attract anyone who has ever set foot on this land. In summer, Hanoi has Sấu (Dragontomelon fruit), and Cốm (green rice flakes) in autumn, what about winter? 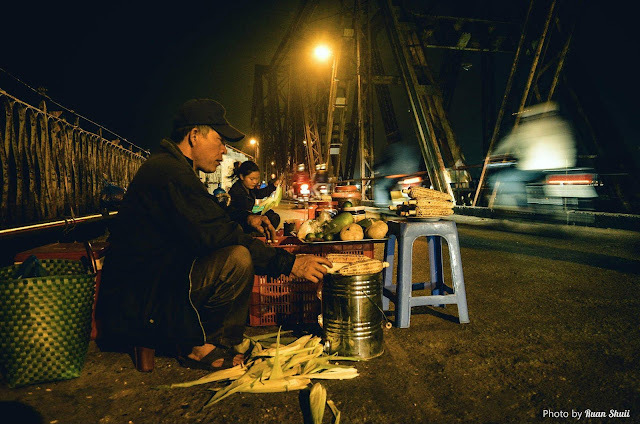 Hanoi has many dishes attached to the cold weather of the winter, these dishes are thought to be more delicious when being tasted in the cold monsoon like barbecue, hotpot…. 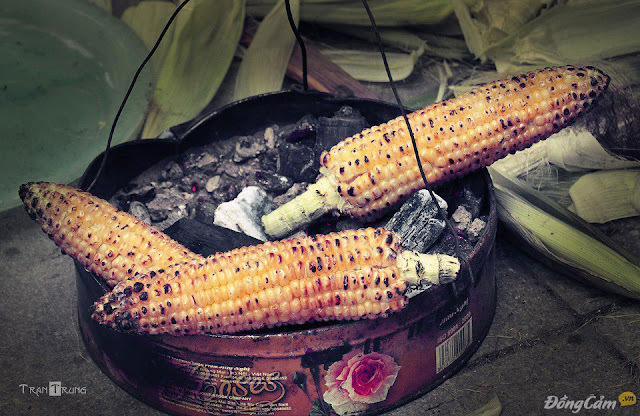 However, is there any simple but warm snack that people just look forward to the coming of the winter to sit around the charcoal stove and wait to enjoy its flavor as grilled corns? Yes or no? The streets of Hanoi in winter still have red tile roofs, the green trees along the street, but Hanoi streets are sadder and more overcast. In the evening, the streets are darker and colder, but maybe that’s why we always feel thrilled and a strange warmth arises in our heart like a secret gift handed hurriedly when we suddenly see a lonely grilled corns vendor on the sidewalk. Hanoi grilled corns are not special at all in terms of taste or flavor. They are only fresh, chubby corns full of milk placed on the charcoal stove and grilled without being marinated or following any cooking recipes. Grilled seeds corn have a dark yellow color, the cover is crispy, but in fact the inner part is soft, tough, has a lightly fragrant smell, greasy taste of corn milk and of the fresh corn leaves covered around. Well, that's all, it’s very simple but when referring to Hanoi, people will certainly think about eating grilled corns. So, why many people eat grilled corn and consider it a favorite dish in the list of winter cuisine? Probably because of the warmth, the joy when sitting and warming around the charcoal fire in cold days. Imagining the situation you huddled on the sidewalk with a close friend, wait for the grilling corns and your faces become dry because of the heat coming from the small basin of burning charcoal. The grilled corn in your hand is the result and the acknowledgment for your expectation. 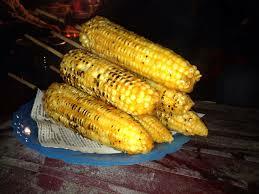 The hot, dark yellow grilled corn makes your hands which were frostbitten because of the cold some minutes ago become warm or even scalded. When tasting grilled corns, you should not eat too quickly, or gnaw big pieces as when eating boiled corns. Eating grilled corns has an interesting thing that is the feeling of finding and eating the seeds one by one, just one to two seeds in your mouth is enough to feel the soft and sweet-smelling flavor of grilled corn. The reason for this is unknown, not because grilled corn is hotter, harder to be eaten as boiled corn, but probably because the taste of grilled corn is and more delicious better and when it's cold, people also would like to nibble more slowly and leisurely.